Laurel Ptak of iheartphotograph fame is crossing the river into my very own state of Jersey tonight. She'll be discussing "The Google Aesthetic" and the impact of internet culture and technology on contemporary art from 7:30-9:30pm at the Pierro Gallery in South Orange. Wes Miller (Associate Curator, Art:21), and Leigh Claire La Berge, Ph.D. (American Studies scholar and 2008 University of Chicago Society of Fellows) are joining her, and the talk will be followed by a closing reception for the exhibition "Is it possible to make a photograph of New Jersey regardless of where you are in the world?" My work is included in the show which I'm happy to be a part of, especially since it's a local deal. Pierro is an excellent gallery and puts on some very cool shows, and the current exhibit hits on many relevant present-day concerns. I'm excited to head out tonight for what I'm sure will be an engaging talk. If you're coming from New York it's only 35 minutes by train; you could leave Penn Station on NJ transit at 6:43 and be in South Orange with time to spare for the 5-minute walk to the Baird Center, where the gallery is located. From the press release: "While the dominate technology of our age—and of this exhibition—is the personal computer, the information that a computer generates is meaningless without the ability to sort, filter, categorize, and search. And any categorization necessarily entails value judgments. 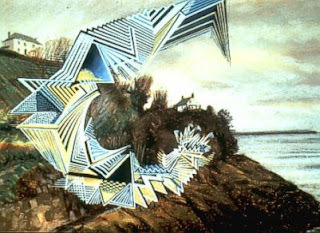 The fantasy of a Google search is that we know the structure of those judgments, and that if we search enough, we will eventually come up with everything. Under Laurel Ptak’s curatorial watch that form of value judgment has also become a form of aesthetic, just as Google becomes an aesthetic form." It was an interesting challenge to submit a piece for the show (you can see my contribution above). I used the concept as a departure from my usual single-image sequences and had a some fun putting together a composition of four joined photos. Since I live in New Jersey I didn't exactly answer the question of whether it's possible to make a photograph of the state from "anywhere" as anywhere, for me, is here. But I'm not a New Jersey native, and my experience of the state growing up was limited to trips to the shore as a kid and little else. 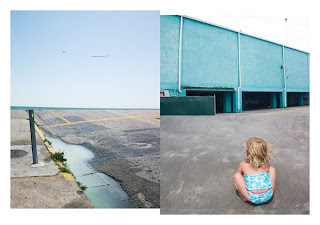 I suppose this nostalgia is what came through in the piece for the show: it's a compilation of shots taken in Stone Harbor, where we vacationed last summer with the girls after not having been back since I myself was young(er). My path to New Jersey was probably fairly typical. I was born and raised in Philly, went to college in St. Louis, after graduating lived in Manhattan for a year and Brooklyn for six, and have family roots in Iowa and Ohio. We transplanted to Maplewood, NJ four years ago when Edie was a baby, deciding the suburban existence--with its backyards and bedrooms to spare--was the life for us. I'd assumed I'd raise my children in the city, but when Edie was born James and I started craving space and the kind of quiet I think you can only get when your room doesn't abut another stranger's. It seems we always lived next to or above a drummer, electric bass player, or loud sneezer. Before actually living here I had my own conventional idea of New Jersey as this ordinary, white-bread, polluted-in-parts kind of place. My firsthand experience has been anything but. Maybe it's the proximity to the city, or the fact that most of our friends are also semi-recent transplants, but there's a vibrancy to the community, and a diversity and artistic tenor that I really appreciate. Many people commute for work and I think it helps keep us from that insularity that can give suburbia a bad name. In short, I love it here in the Garden State. In regard to the "Google aesthetic" aspect of the exhibit, I've been thinking a lot about this notion that "if we search enough, we will eventually come up with everything." It's as if the human brain can't comprehend the infinite expansion of the universe, and, by relation, the infinity of the internet. I myself am under the misconception that someday I'll get "caught up" with reading blogs or looking at other people's work. The problem is, people keep on creating, and there's no way to freeze the multiplication. We'll never reach the end. I have this same problem with laundry, to-do lists, and the like. It's as if I keep constantly rushing to complete the repetitive "wash, fold, put away" sequence, thinking that someday I'll be able to sit down with a sigh and say, there, I've done it. I've finished the laundry, answered all my emails, fill in the blank, in perpetuity, and now and forevermore I can just be. Which obviously is never going to happen. Not even when the kids are grown and out of the house. The only way to deal with the yawning enormity of always having some task to complete is to approach it all with a "chop wood, carry water" mindset. Maybe there's beauty in the laundry. If I can accept the infinite repetition, then it doesn't feel quite so daunting. There will always be more to do, so plunge into the blogosphere as if it's a grand journey and not an assignment to be completed. There will always been a post missed, a wonderful site unseen, but enough great work will be read and looked at regardless. It reminds me of a lecture Ray Bradbury gave at Washington University when I was a sophomore or junior. He said something to the effect that the key was to just read, look, experience as much as possible and not to worry too much about organizing it all, as long as you were passionate in your endeavor. Take it in and let the rest go, and your brain will naturally cook the ideas on its own, until they eventually come together in some structured way that you couldn't have conducted if you tried. I'm going to do my best to follow his advice and leave the rest to my subconscious. By the way, the exhibit is open through this Sunday, May 25; I'll be gallery sitting on Saturday from 1-4pm so be sure to say hello if you stop by.